Add some wind chimes to your backyard or garden and bring some soothing sounds into your natural environment. Here we'll show you ways to make your own. Imagine you’re sitting outside in your favorite chair or hammock, enjoying the bright summer sun and the soft ambient sounds of the surrounding neighborhood. A gentle breeze sweeps over you, rustling your hair, accompanied by the soft tinkle of a chime. Sounds nice, right? Wind chimes come in hundreds of varieties, differing in size, sound, material, and style. You can find wind chimes at a ton of different stores, and you’ll choose from metal and glass, small and long, and other different features. You’ll also end up spending a lot of money on one. 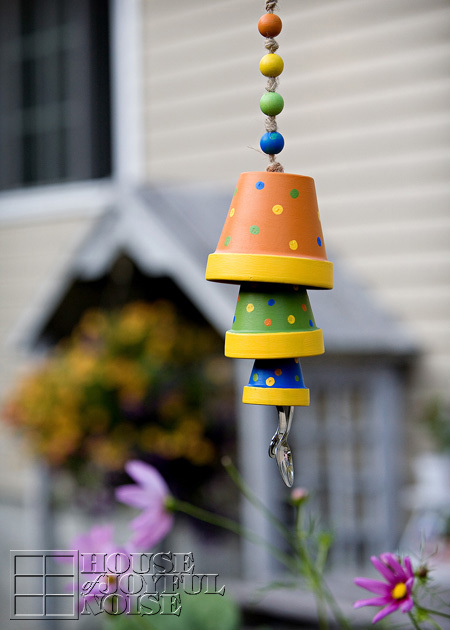 We’ve rounded up a wide variety of easy wind chime projects that you can do at home with your kids. Most of these projects can be assembled within an afternoon and enjoyed for years to come. So whether you prefer a metal, glass, or ceramic wind chime, we’re sure you’ll find a project in this collection that you’ll just love! 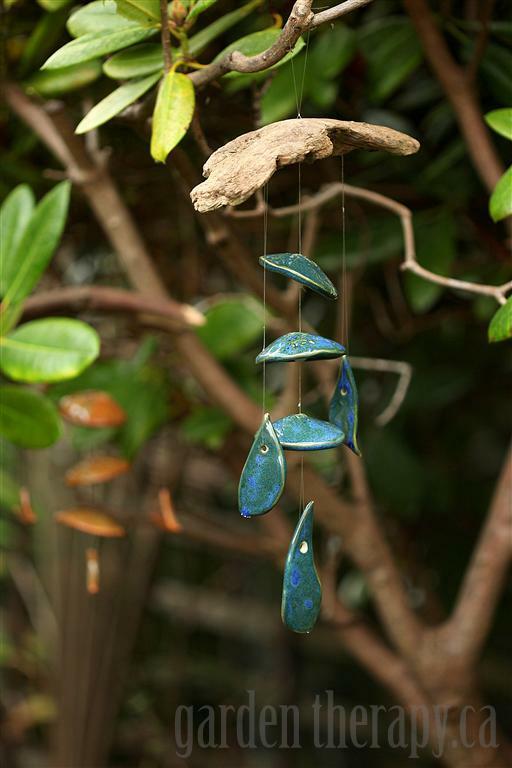 This adorable, simple wind chime is made from glazed clay pendants and a piece of driftwood. You could also choose to use shells for this project, for a more beach-style chime. 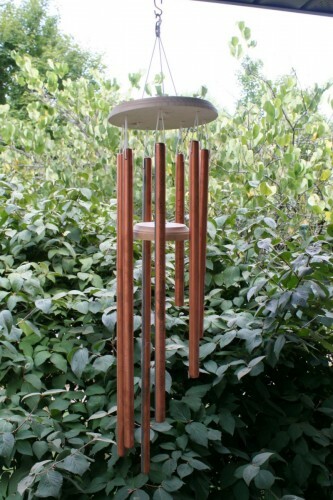 This is a smaller chime that is perfect for anywhere in your garden, around your patio, or on your front porch. Make your own clay pendants and glaze them to get the exact colors and patterns you desire. Find the tutorial here! 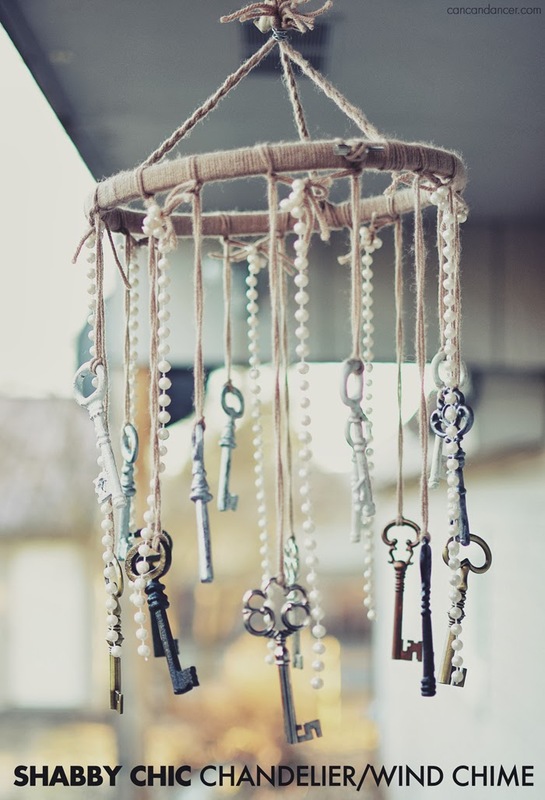 Faux pearl strands, twine, and a variety of antique keys make an incredible rustic, yet elegant wind chime. This chime will probably be much quieter than other projects, but will sway in the breeze just beautifully. Use an embroidery hoop to create the top of the chime. This is an incredibly easy project that shouldn’t take you more than a few hours! Find the tutorial here! This project calls for a bit of twine, a sturdy stick, and several stakes of bamboo. You’ll cut the bamboo to your liking, and then paint them before hanging them from the branch you found. This chime will make a delicate sound as it swings in the breeze. This is a great project for kids, but you’ll need to be around to use the saw! Find the tutorial here! A simple chime made from several cheap terra cotta pots you can find at a dollar store, along with a couple of spoons. Paint the terra cotta pots to your liking, then attach the pots to a sturdy rope with the spoons dangling from the bottom. An easy taste you can do in an hour or two! For extra style, add ceramic or wooden beads to the rope strand. Find the tutorial here! 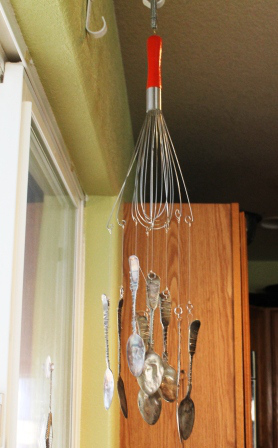 This adorable shabby-chic wind chime makes use of a few battered antique spoons, and old whisk, and some wire. The materials to make this cute kitchen wind chime are all readily available at any flea market or antique shop. Hang this near your kitchen window to hear a soft tinkle of chimes when the wind blows. Mason jar crafts are incredibly popular, and for good reason. 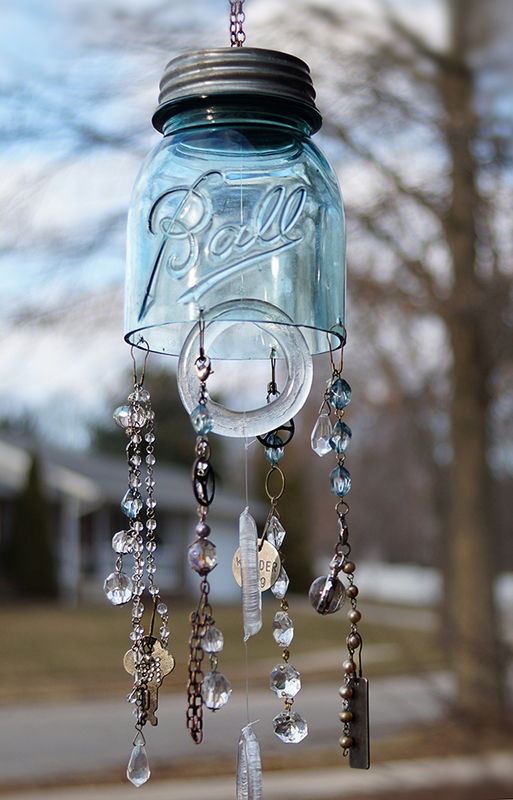 This chime utilizes old pieces of costume jewelry and a mason jar cut in half. This project is a little more difficult and time consuming, as you’ll need to cut and sand the edge of the mason jar in addition to adding small holes to hang your chimes from. Find the tutorial here! We really like our wine, so if you’re anything like us, you probably already have a few empty wine bottles around the house. 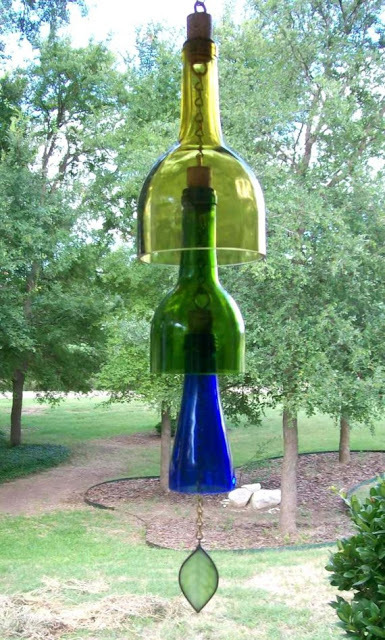 This chime attaches a chain to either side of the corks, then suspends the bottles inside of each other with a small glass leaf at the end. When the wind rustles this chime, you’ll hear the glass edges clink together. Find the tutorial here! The top of this adorable wind chime is made from a decorative ceramic planter, while the chimes are thin glass shells suspended from fishing line. This soothing outdoor chime only costs about $20 to make, and it’s so pretty! The sun shines through the colored shells and creates a rainbow. Find the tutorial here! This simple chime made with copper tubes looks very similar to a wind chime that you can buy in the store. This project is a little trickier, and takes a bit more time and skill, but is worth it! The sound a copper wind chime makes is just gorgeous, not to mention soothing! Find the tutorial here! 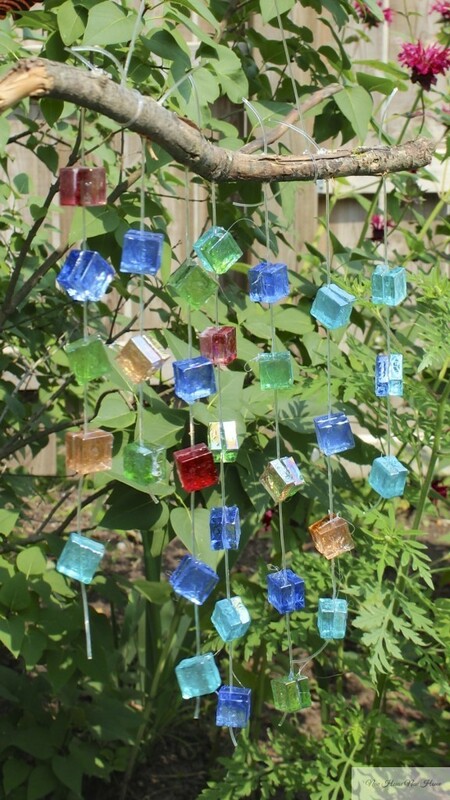 Wrap wire around pieces of sea glass to create this charming, colorful wind chime. Each strand is attached to one of the two circles at the top of the chime. Light will pass through each piece of sea glass, creating a mosaic shadow on your patio or lawn. Just beautiful, and simple to create! Find the tutorial here! 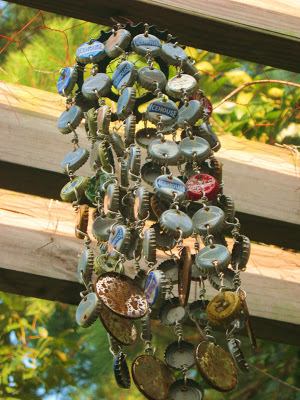 For a more rustic or industrial style, use old, discarded bottle caps to create this all metal wind chime. For the top, use an old gear. Vary the lengths of the strands to create a slightly different look, or make multiple chimes and hang them in a descending line. 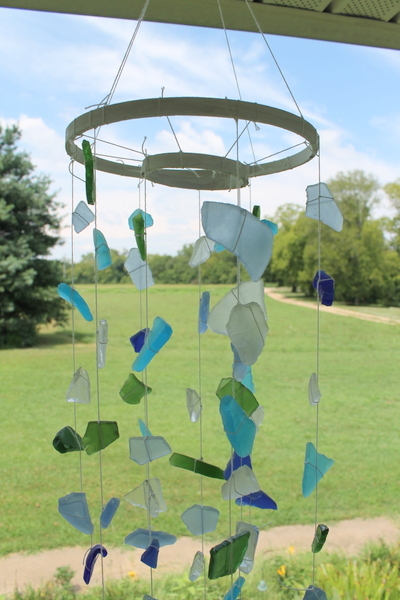 Much like the sea glass chime, this wind chime features colored glass. However, instead of shards, each piece is a perfect cube. The strands go through each cube and are tied to a branch to create the chime. This is an incredibly easy project, since you don’t have to create a support for the chime. Simply tie each strand to a tree branch! Find the tutorial here! If you’re anything like us, you probably have old keys lying around, and no idea where they came from or what they go to. 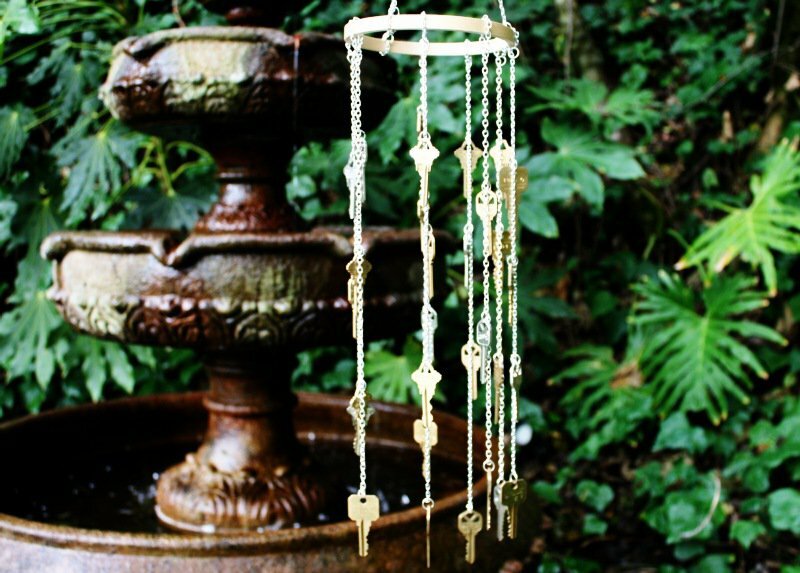 In this case, you can create a delicate all-metal wind chime from a few small chains, the old keys, and a metal hoop. Vary the lengths of the strands or add more keys to find the right amount of sound. Find the tutorial here! 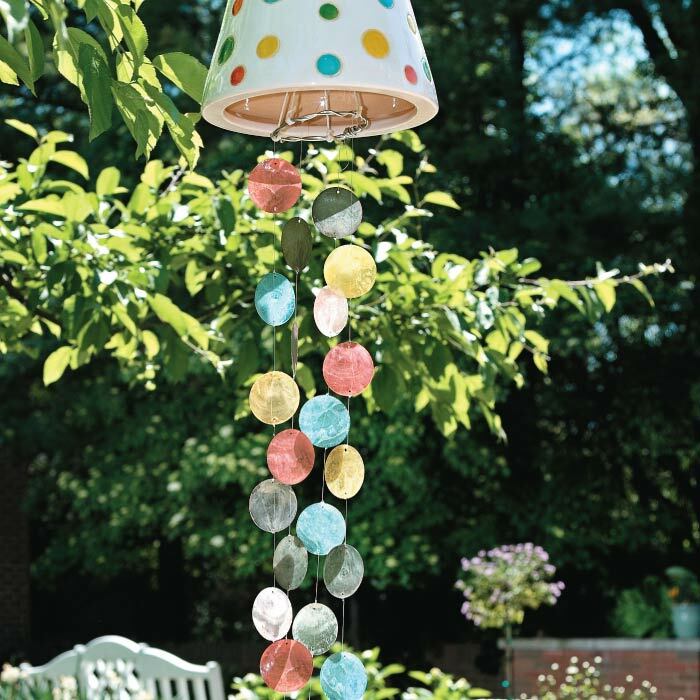 This wind chime is kid-friendly, and it’s a summertime project they’ll love to do. This project uses old cans and other pieces of metal to make the chimes, which are held together with yarn and washers. 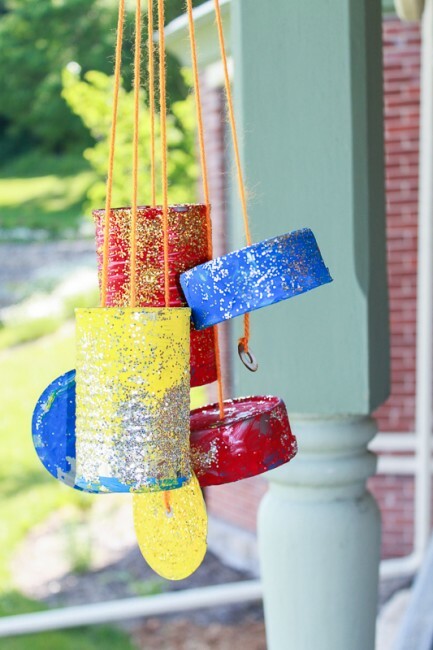 Paint the chimes in bright primary colors, and add glitter to make them sparkle! This would be a great project at a birthday party. Find the tutorial here! 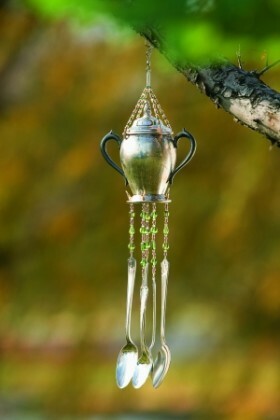 This teensy, delicate wind chime repurposes an old teapot or another piece of the tea set and hangs vintage silver spoons from it with bead chains. This is a smaller option that will look great hanging from a branch, from your porch, or even near a window indoors! We recommend looking for materials for this project at an antique store or flea market! Find the tutorial here! 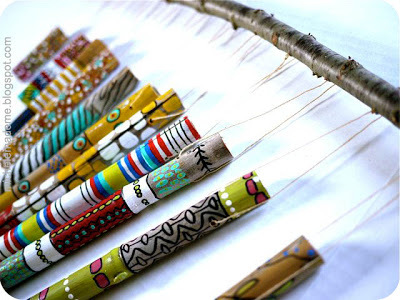 This concludes or gallery of DIY Wind Chimes! Hope you liked it and were inspired. If you’re interested in purchasing a new wind chime, check out our guide on best wind chimes!